The easyThreads Organizer Module helps keep track of your threads and converts from one brand to another. The Pro Edition has all features of the Standard Edition plus the ability to modify manufacturers, brands, thread sets, thread set threads, and category items. Plus, importing embroidery designs, and exporting is available in the Pro Edition. Also, any new functionality in future versions will only be added to the Pro Edition. 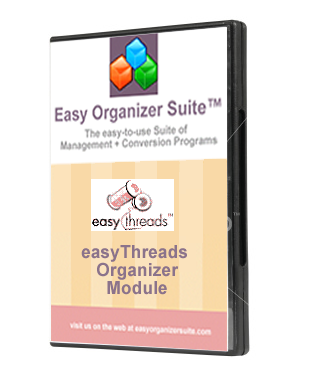 You will receive an Activation Key to unlock the Pro Edition features of the easyThreads Organizer Module. If you choose to purchase the CD, it will be mailed to you.